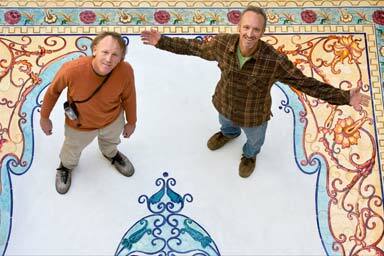 Topanga Art Tile is Leslie Doolin, Matt Doolin, and Paul Doolin as artists and individuals, and as a family. In collaboration we are Topanga Art Tile, a custom ceramic company specializing in hand made porcelain tile fired with hand painted glazes. We use a variety of techniques including raised-line designs and (or) hand painted imagery, to create unique high detailed murals with scenes that are brought to life with our wide range of bright colors and textures.We also use mosaic techniques to create specialized murals, architectural sculpture and home furnishings. We design and make Mirrors, Tables, Seating, Fountains, and Lighting for indoors and outdoors as well as tiling everything from Pools to Fireplaces. Our many years of experience in the tile business (1978 - present) are supported by a comprehensive education in art and design, and a long term connection to the ceramic world. Leslie Doolin, the founder of Topanga Art Tile, has combined her life long dedication to the environment and her education in art to create magic on tile. Paul Doolin has a Bachelor of Fine Arts Degree in Painting and Science Illustration from the University of California at Santa Cruz, and Matthew Doolin has a Bachelor of Fine Arts Degree in Design from the University of California at Los Angeles. This combination of talents is ideal for the type of art we create, and is reflected in the quality and originality of our work. Topanga Art Tile has produced and installed tile murals throughout the world and in some of the finest houses around, as well as restuarants, hotels and other public spaces. Our studio and showroom are located in Topanga, California, and our work is showcased in the Pacific Design Center in Los Angeles, as well as many fine tile stores throughout California. The custom nature of our work brings us close to our clients, which includes designers, architects, contractors and home owners. We enjoy working with others in the designing and developing of project ideas and our artistic training and abilities make it possible for us to portray a limitless range of subject matter. Judging from the success of our many tile mural installations, we are confident we produce some of the finest art tile available.